Members of the Yes campaign left messages in chalk on pavement and buildings Wednesday in Edinburgh, Scotland. On Thursday, Scottish residents 16 and older will vote in a referendum to decide whether Scotland will leave the United Kingdom and become an independent nation. Final results probably won’t come in until Friday morning U.K. time, which is after midnight Thursday on the U.S. East Coast. Polls indicate that “no” — meaning a vote against independence — is the slight favorite, although the lead has narrowed considerably. The average of the past 10 polls released has consistently shown “no” leading by 2 to 3 percentage points over the past seven days. That same average had been 8 percentage points or higher all year until this month. Like any polls, these surveys could be wrong. 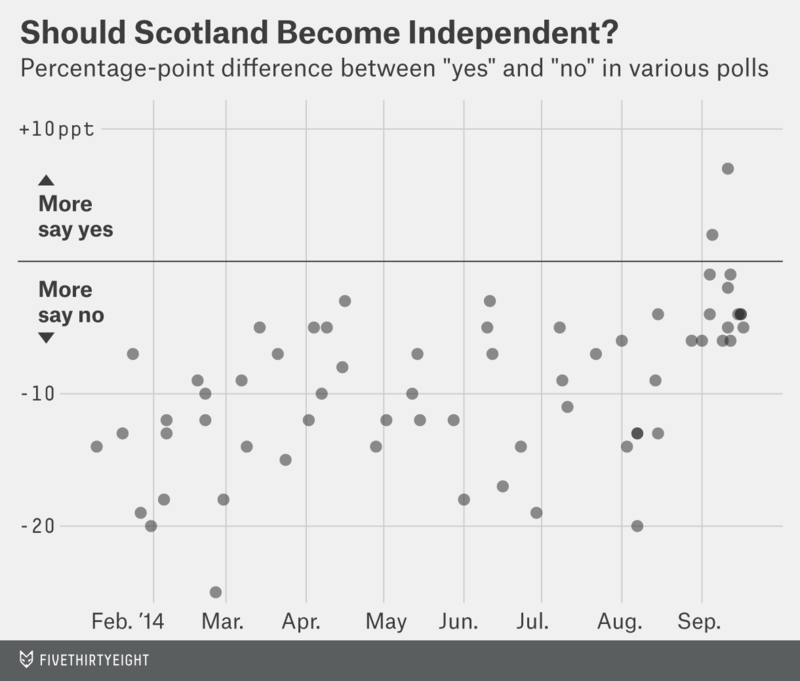 There is no prior independence referendum in Scotland to model the numbers against. And Scotland lowered the voting age for the referendum to include 16- and 17-year-olds, which means their behavior is hard to predict. The “don’t knows” — who have averaged almost 10 percent of respondents in recent polls — could break heavily for one side. Nearly 1 in 5 voters have requested to vote by mail, and postal voters who’ve mailed in ballots but who tell pollsters they’ve changed their mind since voting could skew the results. Many of the polling companies use online panels, which risk misrepresenting popular opinion. One consistent finding is that most poll respondents say they are certain to vote — even those who are unsure how they’ll vote. In ICM’s most recent poll, 79 percent of respondents rated themselves as a 10, on a scale of 1 to 10, in terms of certainty they’ll vote. Even 30 percent of those who didn’t know how they’d vote were certain they would vote. Predicting which way councils will lean in the vote is even tougher. First, I turned to the polls. But a typical poll asks only about 1,000 Scotland residents at a time of their intentions. That’s far too few to get reliable estimates for 32 constituencies. 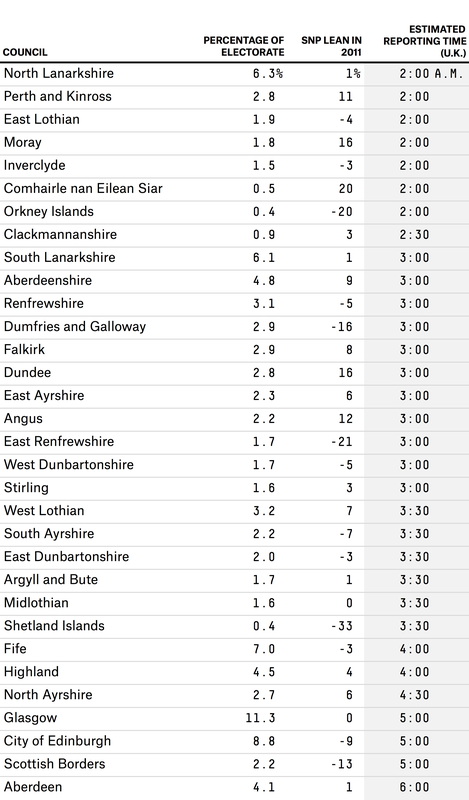 Some pollsters don’t even divide data among the eight Scottish parliamentary regions, citing the small sample sizes. Several who do cautioned against reading too much into the data. A typical solution when any one poll doesn’t have a large enough sample for a subgroup is to add together the subsamples from a few different polls. But as it happens, the polls don’t show any great regional variation in support for independence within Scotland. I checked five ICM polls and two TNS polls since the start of August. For each poll, I calculated the yes-no margin for each region and subtracted from it the Scotland-wide yes-no margin in that same poll. That gave me seven readings for each of the eight regions. But there just wasn’t much difference among regions. All eight regions were within a fairly narrow band, bookended by the region of Mid Scotland and Fife, which was 9 percentage points more pro-independence than Scotland overall, and South Scotland, which had a 7-point “no” lean. That’s consistent with regional results from the 2011 Scottish parliamentary election: Vote share for the pro-independence Scottish National Party in each of the eight regions was in the relatively tight range between 39.2 percent in the Lothian region and 52.7 percent in the northeast. Extrapolating these minor regional variations to the 32 smaller areas covered by the councils that will count Thursday’s votes would be highly questionable. So I turned to more localized results of the 2011 election. That race wasn’t solely about independence, but the SNP was the pro-referendum party, and its victory paved the way for the independence vote. For each council, I estimated the percentage of its voters who backed the SNP, then subtracted from that the SNP percentage for the rest of Scotland. The 32 local councils that will be responsible for counting votes Thursday don’t map perfectly to the 73 parliamentary constituencies — some of them straddle two councils. In those cases, I split the votes evenly among the two councils. I’d urge caution in putting too much stock in these numbers. Some of the constituencies with lower SNP numbers had three or more strong candidates and still elected a member of the party to Parliament. And even the voters who based their 2011 choice on independence have had three years to change their mind — or move, or die. UPDATE (Sept. 18, 12:48 p.m.): On Thursday, the pollster Opinium sent me regional breakdowns for its two latest polls. Opinium uses slightly different regions than other pollsters — nine instead of eight — but the result was consistent: There was very little difference among regions. Adding the two polls’ regional subsamples together yielded a narrow range between 41 percent for “yes” (in Tayside, which includes the city of Dundee and its surroundings) and 51 percent (in Fife, just south of Tayside). CORRECTION (Sept. 18, 2:43 p.m.): The average of the past 10 polls on the referendum had been 8 percentage points or higher all year until this month, not 8 percent higher.